As the prime consultant, AmerCom Corporation completed its third bridge replacement design utilizing Accelerated Bridge Construction. 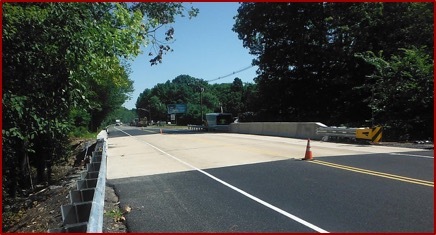 This custom design completely replaced this bridge superstructure on US Route 206 in nine (9) days from Friday night, July 6th and opened two days earlier than planned on Sunday, July 14th, 2018. This work for the NJDOT involved the final design of a new bridge superstructure using modified Next Beam units, new parapets, guide rail, approach slabs and repairs/modifications to the existing substructure. Construction proceeded with a complete closure of Route 206 while traffic was successfully detoured for less than two weeks. The roadway closure was heavily covered in the state and local news in print, social media as well as NJ 101.5FM. One of the signalized intersections on the detour route experienced minor traffic buildup on the first day. A site visit from AmerCom’s traffic engineer resulted in adjustments to the traffic signal timing which successfully solved the traffic issue for the duration of construction. It should be noted that car and truck traffic had separate detours. Site disruptions were minimized as there were no access, ROW or utility impacts. All construction work was designed to be within the ROW. Permits included NJDEP Flood Hazard Area Individual Permit and a Wetlands General Permit. In order to simplify the permit process and cause as little disturbance as possible to the surrounding sensitive environmental area, the new structure maintained the existing waterway opening below the bridge using precast faux fascia beams and there was no work done in the stream channel (Category 1 Waterway). 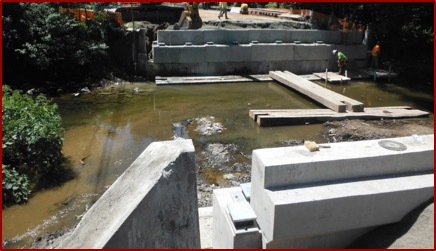 The existing substructure was cut at a preset elevation and new precast concrete bridge seat/backwall units and elastomeric bridge bearings were installed. AmerCom’s engineers actively monitored the traffic detour on this high profile project to avoid traffic flow issues. The media’s initial on-air negative expectations were won over by praises as the bridge opened two days ahead of planned schedule. Since there was clear weather during the entire duration of construction, some of the gains in the schedule were from extra time built in for potential weather related delays.